A green/complete street concept design was developed for Spring Street, a primary arterial street on the west side of the city that roughly parallels Highway. 101. Targeted improvements were evaluated that could integrate stormwater management, improve pedestrian safety and address the jagged nature of the existing curb line. 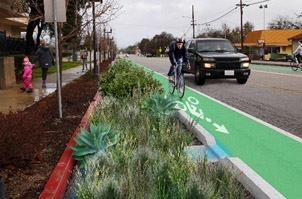 Many sections of the roadway are in poor condition and the City of Paso Robles (City) plans to improve the roadway and integrate Green Infrastructure. Spring Street has excess width to accommodate stormwater strategies. Forty-five potential bioretention facilities and four traditional landscape facilities were identified. Additionally, the City can use the facilities as part of a Watershed Plan or similar strategy to leverage growth, address stormwater quality requirements, and provide community benefits.